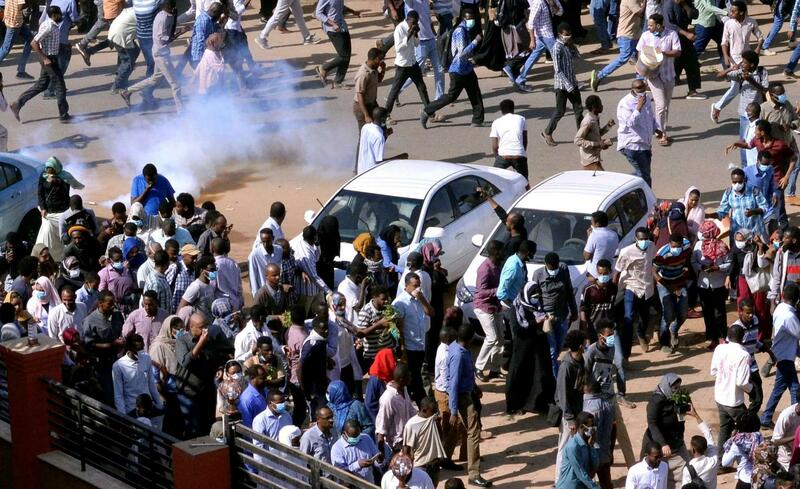 Geneva - The systematic repression and excessive use of force by the Sudanese government against popular peaceful protests in Sudan since 19 December 2018 are deeply shocking, says the Euro-Mediterranean Human Rights Monitor. The security forces stormed a room where the protesters were protecting themselves. They began beating and insulting protesters, threatening to imprison them. At least 45 people have been killed since the start of the events, added the human rights group, calling on the Sudanese government to put an end to the repressive practices against journalists and protesters. Instead of using excessive force against peaceful protesters, the Sudanese authorities are urged to heed their justified demands and to guarantee the delivery of basic services to ensure a decent life for the Sudanese people. The Sudanese authorities said 29 people were killed during the protests, but statistics obtained by the Euro-Med Monitor reveal that the number of people killed in fact was double that of the government. At least two people were killed during demonstrations last Thursday, which the security forces faced with live ammunition and the excessive use of tear gas. According to Euro-Med’s field team, Mahjoub Taj Mahjoub Ibrahim, a 20-year-old student at the Faculty of Medicine at Al-Razi University was killed on Thursday after being tortured by security guards. Abdel-Azim Babeker, 22, was shot in the chest. “The security forces attacked the funeral and beat some of the participants,” said mourners at Mahjoub's funeral. Euro-Med noted that protests began in Atbara, to the north of the country, then moved to other cities and regions, including Gedaref, Al-Fasher and Khartoum, to protest the high prices and the deteriorating living conditions. Protesters were faced with intensive security presence and excessive use of force, such as tear gas, batons, live ammunition and rubber bullets. Human rights activist Asil Abdo described on her Facebook page how the Sudanese security forces treated protesters on January 17, 2019 during protests called for by the opposition Sudanese Professionals’ Association in Khartoum, noting that the security forces initially tried to disperse a large number of protesters using tear gas before they used rubber bullets, which caused the injury of many protesters. In her testimony, Abdo stated that the security forces stormed a room where the protesters were protecting themselves. They began beating and insulting protesters, threatening to imprison them. Euro-Med condemned the government's continuing crackdown on protesters, highlighting the arrest of hundreds of people in recent weeks. Sudan's Interior Minister Ahmed Bilal Othman said in a press release that the Sudanese authorities had arrested 816 people at 381 demonstrations in various Sudanese cities, but the number of detainees has likely exceeded that figure. Testimony on the ground confirmed to Euro-Med that the search and arrest campaign included writers, students, journalists, human rights defenders and opposition leaders such as Masoud Mohamed Hassan, Saleh Mahmoud Othman and Masoud Mohammed Al Hassan. Euro-Med Monitor also condemned the Sudanese authorities’ withdrawal of work permits from correspondents of Al-Arabiya, Al-Jazeera and the Turkish Anadolu News Agency, as well as the closure of some press offices because of their coverage of the events in the country. In addition, the Sudanese authorities have disrupted social media networks and blocked the work of some news websites to try to hide the reality of what is happening on the ground. Sudanese security forces have also been blocking the Sudanese newspaper, Al-Jarida, from being issued. for more than two weeks, arresting the newspaper's editors, as well as banning the Sudanese Baath Newspaper. Dozens of journalists have been banned from writing or publishing. Reporters Without Borders has recorded more than 100 press freedom violations in Sudan during the last month, including the arrest of 66 journalists. “The Sudanese authorities holds full responsibility for the lives and safety of protesters and must open a formal and transparent investigation into the excessive use of force against peaceful protesters and should immediately cancel the closure of press offices and release journalists and activists,” added Pritchett. The Euro-Mediterranean Human Rights Monitor calls on the Sudanese government to heed protesters' demands, offer the Sudanese people a decent life, and stop violating their fundamental rights.